This Lemony Lentil Salad is super simple, super tasty, and super healthful. It's also super basic, and easy to dress up with whatever seasonal veggies you picked up at the market—see the many optional additions listed below to mix and match as you like. 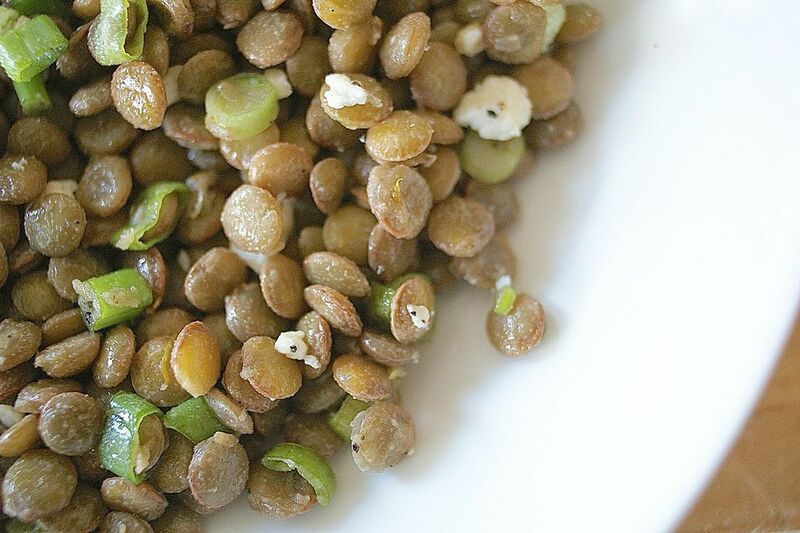 While most types of lentils work here, and I like to use tiny green French lentils when I have them on hand, as you can see from the picture, the more common brown lentils work very nicely, too. Softer, hulled red lentils are trickier in salads. If you do decide to use them, be careful not to overcook them. The wonderful thing about this basic salad is that you can enliven it by adding optional items, such as chopped hard-boiled eggs, shaved or thinly sliced fennel, crumbled feta cheese or cojita, and toasted walnuts or pine nuts. Put the lentils in a large pot. Cover with 6 cups cold water and bring to a boil. Reduce heat to maintain a steady simmer and cook. When the lentils re about half-way cooked (they are almost done but still have a hard center when you bite one), add the salt. Continue cooking until the lentils are just tender to the bite; the total cook time will vary depending on the type of lentil you're using. Drain and set aside. While the lentils continue to drain, make the dressing: Peel and mince the garlic or shallot and put it in a large bowl. Finely grate 1 teaspoon lemon zest into the bowl, being careful to only grate off the bright yellow part, avoiding the bitter white pith underneath. Halve the lemon and squeeze 1 tablespoon fresh lemon juice into the bowl. Add the pepper and mustard and quickly whisk to combine. Let sit about 5 minutes. Whisk in the olive oil. Shake any remaining excess water off the lentils. Add the well-drained lentils to the bowl and toss to combine so the lentils are evenly coated with the dressing. Trim and finely chop the spring onion or green onions and add them to the lentils. Add any of the optional additions that appeal to you and are in-season!